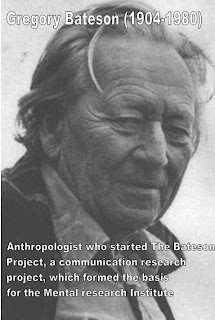 The Progress-Focused Approach: Gregory Bateson's main contribution to the solution-focused approach? Gregory Bateson's main contribution to the solution-focused approach? "I one day asked Jay Haley what he thought was the most important contribution Bateson had made toward family therapy. He replied that it was finding the money to send John Weakland and him to spend time with Milton Erickson on a couple of occasions each year." Bateson is often cited as an important influence in his own right but this quote suggests it might be more realistic to view Bateson's role more as a secondary one. I tend to think that his main contribution was to start the Bateson communication research project in which people like John Weakland and other spend many hours analyzing taped conversations by extraordinary therapists like Milton Erickson and Don Jackson. Especially Milton Erickson seems like a much more important and path-breaking figure to the development of the solution-focused approach. Granted, this is only my interpretation. Another interpretation of mine is that there was another philosopher who has been more important to the development of the solution-focused approach than Ludwig Wittgenstein.